Power usage analysis - frequency and sleep states. The GUI will open in new window. Click on "New Project..." to create a new project. After clicking OK, a new window with project properties will appear. At "Application:", select the bath to your binary you want to profile (the binary should be compiled with -g flag). Some additional options such as command line arguments can be selected. At "Managed code profiling mode:" select "Native" (unless you want to profile managed mode .NET/Mono applications). After clicking OK, your project is created. To run a new analysis, click "New analysis...". You will see a list of possible analysis. Some of them will not be possible on the current CPU (e.g. Intel Atom analysis is not possible on Sandy bridge CPU), the GUI will show an error box if you select the wrong analysis. For example, select "Advanced Hotspots". Clicking on Start will start profiling of the application. 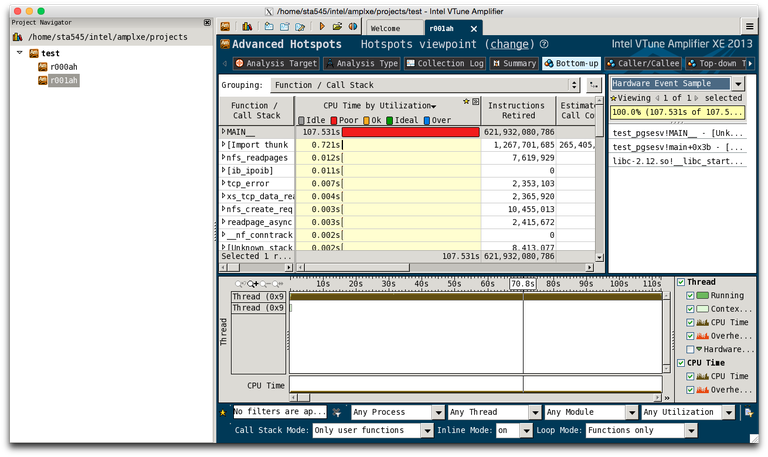 VTune Amplifier also allows a form of remote analysis. In this mode, data for analysis is collected from the command line without GUI, and the results are then loaded to GUI on another machine. This allows profiling without interactive graphical jobs. To perform a remote analysis, launch a GUI somewhere, open the new analysis window and then click the button "Command line" in bottom right corner. It will show the command line needed to perform the selected analysis. Copy the line to clipboard and then you can paste it in your jobscript or in command line. After the collection is run, open the GUI once again, click the menu button in the upper right corner, and select "Open > Result...". The GUI will load the results from the run. It is possible to analyze both native and offloaded Xeon Phi applications. This mode is useful for native Xeon Phi applications launched directly on the card. In Analysis Target window, select Intel Xeon Phi coprocessor (native), choose path to the binary and MIC card to run on. This mode is useful for applications that are launched from the host and use offload, OpenCL or mpirun. In Analysis Target window, select Intel Xeon Phi coprocessor (native), choose path to the binaryand MIC card to run on. If the analysis is interrupted or aborted, further analysis on the card might be impossible and you will get errors like "ERROR connecting to MIC card". In this case contact our support to reboot the MIC card. You can obtain this command line by pressing the "Command line..." button on Analysis Type screen.